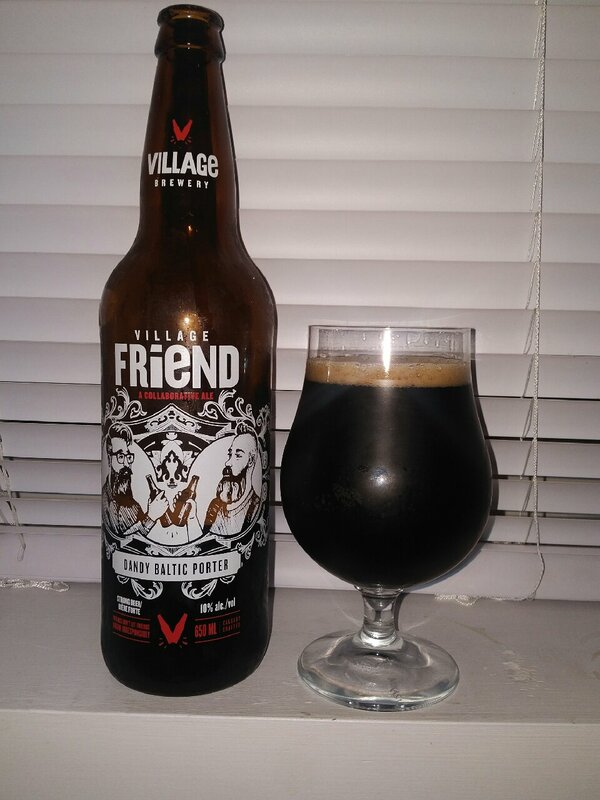 Village Brewing in Calgary Alberta came together with the Dandy Brewing Company to brew up “Village Friend (Dandy Baltic Porter)”. The beer pours a very deep brown with a brown head. The aroma consists of roasted malts, ash, molasses and sweetness. The flavour is of dark fruits, molasses, sweetness, earth, ash, toffee and roasted malts. If the alcohol content comes in at 10%. I am a big fan of the Baltic Porter and these two Alberta breweries have come together to make a great beer! Commercial Description: Dandy introduced us to Baltic Porter, and we’re forever grateful. Baltic’s a big-hearted, full-bodied brew, dark and rich, with a fine nose of herbs and spices. He has a hint of an English accent, and a wicked, dry wit. We think he’s brilliant. So here’s to Dandy. Thanks to you, we’ve made a new Friend. One good friend is enough. Drink responsibly. This entry was posted in Imperial, Porter and tagged alberta, ash, calgary, collaboration, dandy baltic porter, dandy brewing company, dark fruit, dark fruits, earth, molasses, roasted malt, roasted malts, sweet, sweetness, toffee, village brewing, village friend.